Superman pounds away at Green Arrow, until Martha Kent physically stops by grabbing his forearm. A surprised Superman quickly surmises that Martha has ingested on of the "super-pills" and notices that one is missing. Batman returns to his group, and is unresponsive when asked where Green Arrow is. Batman does inform his people that they are out of time and that Superman will be coming for them. Catwoman tries reason with Batman, but gives her a kiss farewell and doses her with gas to keep her from following. Back at the Fortress of Solitude, Jon and Martha try to reason with Superman, and even the holographic representation of Jor-El makes the attempt, but Superman determined to stop Batman once and for all, and flies off to confront him. Story - 4: The tragedy of Superman and the Justice League continues, though defining it as a tragedy would only get you on Sophocles' bad side. The downfall of a good and noble person, someone above the common, is all ways interesting, as these heroic people are placed so far above us, the knowledge that they can suffer like any commoner is a reminder, and perhaps a refreshing one for the part of us that indulges in Schadenfreude. However, a tragedy works best when there is a distinct point that can be seen; a demarcation that separates the soaring hero from his fallen end. Injustice does not offer that Rubicon to us. Superman is never shown at his best or Batman at his apex; they're introduced with the knowledge that the reader knows of them outside of this story, and just how good and great they are. The mistakes they make are accepted as a part of the fall, because of the muscle memory the reader has acquired for these characters. Injustice is a tragedy akin to Macbeth (no, it does not have the quality) in that the viewer asks: "What was ever good about this person?" Richard III has the great opening monologue that explains why he's where he's at, but like Macbeth, the reader has to wonder how things have gotten to this point without seeing what the characters were like before the death of Lois Lane. This isn't the first time that Lois Lane has been used as a catalyst to cause Superman to tread a darker path, and when he has, it's never been to this extreme. It's not Lois' death that Superman has to contend with, but Murphy's Law unhinged and the filmiest of morality to combat it with. Regime Superman's morality was so tied to Lois Lane that his hypocrisy is pathetic when he blames Batman for her death, because the Joker continued to escape under his watch. It's equivalent to saying that all those deaths were fine, so long as nothing happened to his own. Batman saying that Superman has changed is hypocrisy cubed, as he can longer be the same individual either by far. 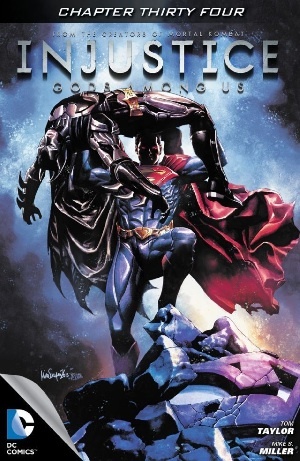 The showdown that I've been looking forward to seems to finally be at hand, and while this issue continued to entertain in the way all Omega-type stories do, especially comic books, the question of how it got here is a challenging one. It would be one thing for Superman to go nutter, but every single one of the League is botched in some form or other, which is a wonder as to how they kept things together as long as they did. Art - 4: The best of the issue are the differing looks of Superman's face: clarity, contempt, and conflagration. It's all done pretty well. Cover Art - 4: I love it for reasons that can only be defined as Schadenfreude.